R.A. The Rugged Man is back with a new episode of his podcast, The R.A. The Rugged Man Show (aka 'Ignorant Long Island Guy's Podcast’). This time, R.A. is joined by filmmaker Frank Henenlotter, known for writing and directing cult horror classics like Brain Damage and Frankenhooker. The host and guest have a history together, as they co-wrote the acclaimed 2008 film Bad Biology, which was produced by the Rugged Man and directed by Henenlotter. With R.A.'s protege A-F-R-O serving as guest host, Henenlotter recalls wild stories from New York’s 42nd Street theaters in the 1960s and 70s, displays his deep knowledge of movie history, explains some of his most memorable scenes, and praises the work of some of his favorite directors, including Jess Franco, John Huston, Otto Preminger, and more. New York City’s prestigious Museum of Modern Art recently added Henenlotter’s iconic first feature Basket Case to it’s permanent film collection and commissioned a brand new 4K restoration of the film from the original 16mm negative. First screened at MoMA in late 2017, the restoration is now receiving a special edition Blu-ray release courtesy of Arrow Video, featuring exclusive cast interviews, new audio commentary by Henenlotter, outtakes, rare photo galleries, a collector’s booklet, and much more. R.A. The Rugged Man is back with a new episode of his podcast, The R.A. The Rugged Man Show (aka 'Ignorant Long Island Guy's Podcast’). This time, R.A. is joined by actor James Paxton, the son of legendary actor/director Bill Paxton. A true hip-hop head who was often spotted at rap shows with his dad, James kicks off the episode by performing a heartfelt verse dedicated to his late father. R.A. and James then discuss Bill Paxton’s remarkable career, including iconic roles in films like “The Terminator”, “Aliens”, “Weird Science”, “Titanic”, “A Simple Plan”, “Twister”, “Mighty Joe Young”, “Frailty”, and more. This leads to an emotional discussion on his recent death, which R.A. relates to the painful experience of losing his own father, Staff Sgt. John A. Thorburn, a few years ago. R.A. The Rugged Man is back with a new episode of his podcast, The R.A. The Rugged Man Show (aka 'Ignorant Long Island Guy's Podcast’). This time, R.A. is joined by hip-hop legend Masta Ace and young microphone assassin Chris Rivers (the son of dearly departed rap god Big Pun) for a fascinating hip-hop discussion. The conversation covers the Juice Crew’s impact on the culture, hip-hop’s greatest live performers, what makes a classic album, the importance of storytelling in hip-hop, Big Pun's untimely death, the downfall of Cold Chillin’ Records, and much more. Also joining the show are famed producer Marco Polo (who supplies beats for a few freestyle sessions) and talented Rhode Island spitter Passionate MC. Fresh off a U.S. tour, R.A. 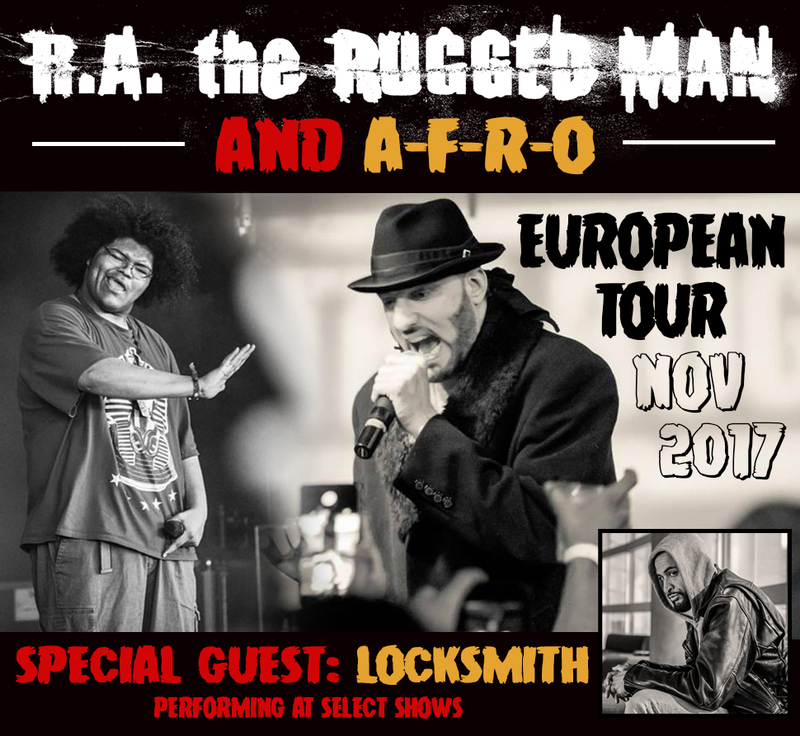 The Rugged Man is now hitting stages across Europe, with support from A-F-R-O and Locksmith. Check out the full schedule below.